2) Collector Raids - This is a base, typically with resource collectors on the outside of its walls, with full gold mines/elixir collectors/DE drills. Barch, BAM, GiBarch, Goblin Knife, and similar raids work well here. 3) Storage Raids - Raiding these bases are usually a bit tougher. Resource storages are usually IN the base walls, behind 2 or more layers of defense, and not easy to reach. You'll need a stronger army to get the most from these raids. GiWiz is my goto for these, but others use a variety of attacks to break through and get the storages. When hitting dead bases or running collector raids (similar to same) you want something like bar he or all goblins because you need to hit a bunch of collectors fast. These raids tend to hit collectors outside the walls but, in the case of dead bases, you may also want to hit storages. Dead base raids are particularly favored by higher level players because TH9 thru TH11 have defenses that run out of ammo (x-bows, infernos, eagle artillery). Even lower TH players can take advantage of dead, high level bases. What are some useful army comps and when do they work best? The very beginning of the game (TH2, TH3, TH4) has low capacity army camps so your best bet is going to be BARCH. This is a roughly even division of barbarians and archers. At TH, you get your wallbreakers and they'll help open bases up but they occupy 2 troop units in your army camps, so use them sparingly (maybe 2). Raiding for these first few levels is not bad; you don't need a whole lot of loot to fund your upgrades, so creative army compositions are not necessary. If you decide to go strictly for collector raids, you can also use goblin armies. TH5 and TH6 represent the first time that you have enough army camp space to really branch out in your army composition. BARCH still works great, and lots of players still use it. BUT...there's enough space to start using GiBarch. My favorite army composition here (and at higher levels) for a quick training, low cost army is to fill each barracks with 2 giants, 2 wallbreakers, then a roughly even split of barbarians and archers. This is especially good when you're running with boosted barracks. Deployment is straightforward - drop the giants to start breaking in; wallbreakers to open the base; barbarians to beat the base up and further protect the archers; then finally the archers to bring up the rear. TH7 and early TH8 use these same armies well, especially GiBarch. As the giant gets strong, a lot of players will move to using a giant-healer army to just plow through a base. Somewhere between TH6 and TH7 is when you'll notice the cost of your upgrades (and new items) on the rise. This is especially the case with TH7 where you'll have the dark elixir (DE) drill, DE barracks, DE storage, and teslas hitting you up for over a million in resources. TH7 is very much the entry point to the game; everything up to that point is just getting familiar with the basics of the game. As costs rise, you'll have a choice to make - do you want to hit NEXT a lotta, lotta, lotta times or do you want to start hitting storages for a better haul. 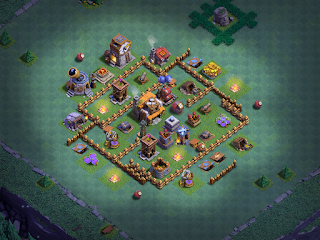 Many players have the patience to run collector raids and/or search for dead bases. Many more have moved to stronger armies, even war grade. GiBarch works well with most base designs, providing the flexibility to go in for storages or hit collectors but even there, bases with storages arranged on opposite sides of the base or even all around the base will require much more as you'll need to take out a large percentage of the base to make the raid worthwhile. Late TH8 and onward runs much the same as I mention above and adds even stronger armies to the mix. I commonly use a Giants-Wizard-Healer army set up with each barracks holding 1 healer, 4 giants, and 4 wizards along with some heal and rage spells. Sometimes, I'll replace one wizard in each barracks with 2 wallbreakers. This army, along with picking the right base, typically yields a 75% or better destruction rate with most storages and collectors destroyed. The Barbarian King and Archer Queen are not necessary for good farming results until late TH10 and into TH11. Even then, you can go without if you pick the right kinds of bases to raid. As you work through each TH level, focusing first on offense and then on defense, you'll notice that you end up with an elixir glut at the end of the development phase. A lot of players will use this to build even stronger armies for raiding TH7/TH8. At the end of TH8, I was using GoVaHo, GoWiPe, and Mass Dragon raids. I have a TH7 game that just needs walls done; it has full elixir storages, so I've been running dragon and hogon raids. At TH9 and up, this elixir can be dumped into walls or you can do the same. Raiding will also provide you an opportunity to practice queen walk and super queen. Recent changes to the defensive capabilities of TH9+ and healer levels have dampened these tactics a bit, but they're still very effective among those who skillfully deploy them. An Archer Queen (AQ) with 4 or 5 healers on her can do a LOT of damage, especially clearing out a section of base, creating a funnel for remaining troops to rush the core. Super Queen is a great way to plow straight through to the juicy middle where most players keep their DE storage and, often, their DE drills. Last but not least, there's the Goblin Knife. Goblins are a terribly underutilized troop in CoC. Many players have found them to be EXTREMELY effective at higher TH levels for cutting through to the center of a base, taking down the TH and DE storage, and other storages or collectors. The basis of this strategy is to create a funnel and, using jump spells/wallbreakers/EQ spells, flood the core of a base with goblins. This strategy became effective when SuperCell changed the design of the TH and Clan Castle (CC), making them targets for the goblin. There are a variety of army compositions to use but each starts off with something to clear junk buildings, act as a meatshield, and get the goblins pathed to the core. Some players back it up with something like archers to continue the clean-up work. If you're looking for some video examples of these farming strategies, I suggest just hitting YouTube and searching on their names. BARCH, GIBARCH, BAM, GIWIZ, GIANT HEALER, GOBLIN KNIFE are all commonly used farming strategies.